How to Answer IRS Withholding Calculator Questions About 2018? I've been encouraged by my employer to recalculate my W4 allowances in light of the tax law changes for 2018. I'd like to update my W4 now if there's any advantage to be had, but I'm not sure how to come up with these values. Should I use the value to date? Project into the future assuming nothing changes? Guesstimate? Wait until next year? Some of these numbers are factual, e.g. income tax withheld to date. Others are a matter of planning on your end, e.g. the amount of 401(k) contributions. Finally, the rest are projections, e.g., your gross wages for the entire 2018. You may want to stay on the safe side, which actually means overestimating your income, so that you don't owe penalties for tax under-withholding. It is a good practice to do a mid-year check and course correction. To do this, you check the year-to-date figures, project where your tax liability and your withholdings are tracking, and make changes to your allowances number if and as needed. Not the answer you're looking for? Browse other questions tagged united-states taxes income-tax withholding form-w-4 or ask your own question. Lower withholding based on my calculations. How to get employer to change withheld amount? Why is the 2013 Withholding Calculator giving me such incorrect recommendations? 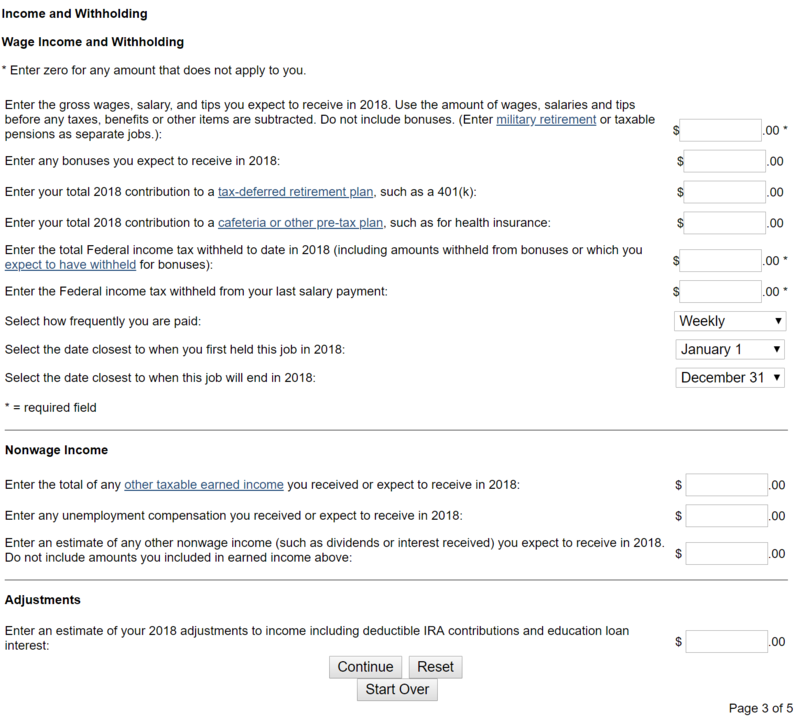 How to make sense of results from the IRS W-4 withholding calculator? W-4 Worksheet for Spouses Filing Jointly: Who Files the W-4? Is a child also a dependent in IRS withholding calculator? If you have many dependents, will using the Number of Allowances from a pre-2018 W-4 cause under-withholding in 2018? Is the return of an IRS withholding taxable?